Need to add an additional hydraulic circuit on your tractor, backhoe or excavator because you have no available circuits? Tap into an unused circuit (i.e. backhoe stabilizer or other) and a switch in your cab will allow you to operate the added circuit with your selected joystick. 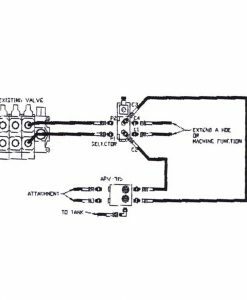 On a backhow you can power a hydraulic thumb by utilizing the hydraulic circuit for stick extension, stabilizer or a lesser used circuit. After installation, your joystick now operates the hydraulic thumb. If you need more help from what our listings offer, please call Equipmentland right now.